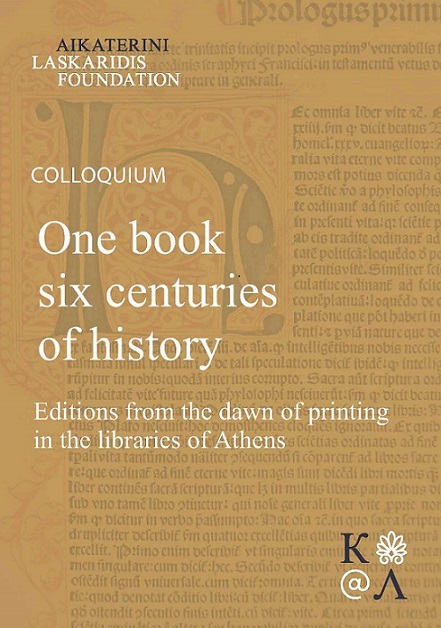 The colloquium focuses on incunabula, books that reached our era from the dawn of printing, the 15th century, as a continuously rising research subject, both internationally and in Greece, using as case studies representative editions from Athenian libraries. It aims to present incunable editions, highlighting their importance for the history of printing; to showcase books of special typographic or aesthetic value; to shed light on their fascinating journey in the course of six centuries. At the same time, it aspires to present research programs that record and study incunabula, as well as bring together professionals who specialize in the handling and promotion of this rare material. In collaboration with the Consortium of European Research Libraries, representatives from the 15cBookTrade project of the University of Oxford will discuss the project and its implementation in Greece. The colloquium took place at the Aikaterini Laskaridis Foundation Historical Library (2nd Merarchias & Aktis Moutsopoulou, 185 35, Piraeus). 10:30 – 11:00 Understanding and communicating the impact of the printing revolution on European society: our collaborative long-term project. 11:00 – 11:30 My work on incunabula in Greece: 1973-1979. 11:30 – 11:45 My work on incunabula in Greece redux: in the footsteps of Dennis Rhodes (2016 – ongoing). 15:00 – 15:15 Thoughts on the Greek Book – video presentation. 15:30 – 15:45 Printing Homer in Renaissance Florence. The Dedication Copy BNCF, B.R. 81. 15:45 – 16:00 Greek Incunabula and Post-Incunabula from the Paul Auerbach Collection in the University of Amsterdam.